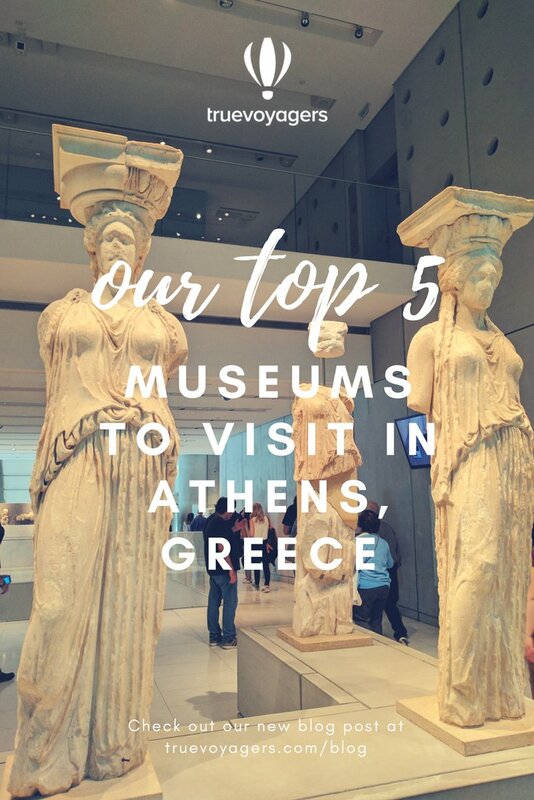 I have been wanting to write about the best museums in Athens for quite a while now, and when I finally got the chance to do so, I realized it was very difficult for me to pick just a few for a top list. Athens has many interesting museums, some of them being top notch, so this made my choice very difficult, maybe because I am a museum person myself and I love going to most of them. To start with, almost every archaeological site has a museum of its own. Thus, it goes without saying that Athens has a lot of must-visit historical sites and many archaeological museums; in fact, Greece has more archaeological museums than any other country in the world. But Athens is not only limited to archaeology. You can also find other kinds of museums depending on your interests like art museums and galleries, the Lalaounis Jewelry Museum, the Goulandris Natural History Museum and the Hellenic Children's Museum, among others. Here is a list of the 5 best museums in Athens, but by no means is this list exhaustive. An additional top 5 will follow in a future blog entry. 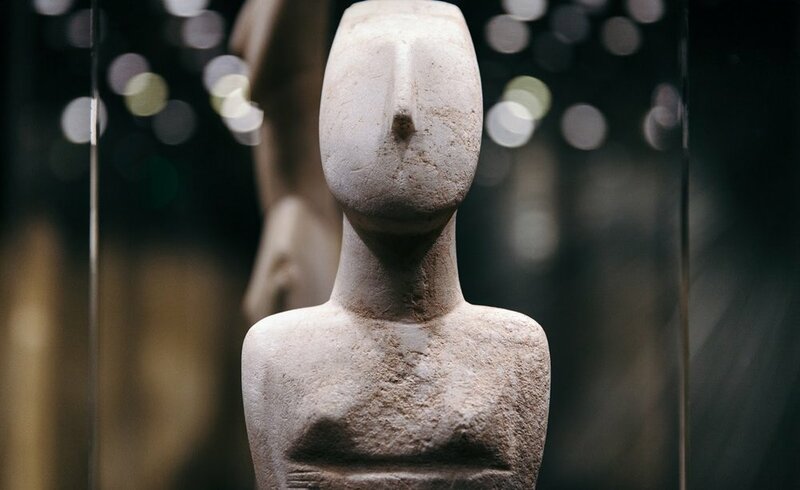 The Museum of Cycladic Art is probably my favorite museum in Athens and the one I have visited the most. I tend to take all my friends who visit me in Athens to this particular museum, mainly because I wrote my MA thesis on Cycladic figurines and I like to show off my knowledge, but also because it is actually a really nice museum. The Cycladic Museum is constituted by two separate buildings which are connected by a glass-roofed corridor. The Main Building (entrance from Neophytou Douka Str. 4) was built in 1985 by architect Ioannis Vikelas and houses the permanent collections. 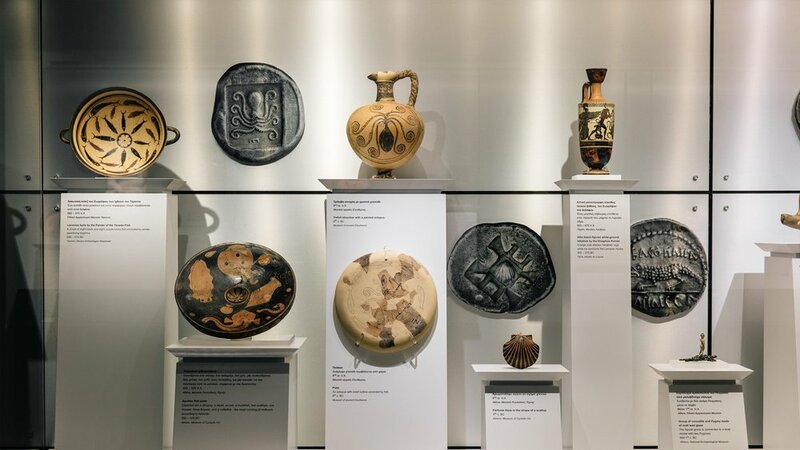 On the first floor you will find the famous Cycladic Collection, with mainly Cycladic marble figurines on display, but also clay and marble pottery, the so-called frying pans, obsidian tools and other artifacts dating back to 3200-2000 BC. If you see a crazy lady taking selfies here next to different figurines mimicking their pose, then that is probably me. The upper floors house the collection of Ancient Greek Art, the ancient history of Cyprus and a thematic exhibition with scenes from Daily Life in Antiquity. On the ground floor you can visit the Museum Shop, the Café as well as the New Wing, which hosts temporary exhibitions, educational activities and seminars. The second building, the Stathatos Mansion, a beautiful example of Neoclassical architecture in Athens, was designed by architect Ernst Ziller in 1895. Today it houses the temporary exhibitions of the Museum of Goulandris Art, which are usually great and worth your time. From 8th June 2018 until the 14th October 2018 it will host the George Condo at Cycladic exhibition. George Condo is an American contemporary visual artist with artistic work including different mediums, like painting, sculpture and printmaking among others. The exhibition at the Cycladic Museum will focus on his work focusing on the human figure, with a total of 30 works spanning over the last 20 years of the artist’s career. Opening Hours: Monday, Wednesday, Friday, Saturday 10:00 – 17:00, Thursday 10:00 – 20:00, Sunday 11:00 – 17:00, Tuesdays closed. More information on opening hours, access and ticket pricing can be found here. Another must-see museum in Athens is no other than the National Archaeological Museum of Athens, the largest one in Greece and a top tourist attraction! The museum is housed in a beautiful neoclassical building designed by L. Lange and Ziller in the 19th century. It is located on Patission Street, with the closest metro stations being Viktoria and Omonoia. The National Archaeological Museum of Athens offers the visitor a panorama of ancient Greek culture and art from prehistory to late antiquity. The collections are exhibited in two floors, so you will need time to check out everything. Some of the exhibits in this museum are quite famous and you may have seen them in your history books! Start with the Neolithic Collection, with archaeological findings from Neolithic settlements and everyday life artifacts. Continue to the Cycladic Collection and afterwards the Minoan and Mycenaean Collections, with very interesting exhibits found here and impressive funerary finds, like jewelry, weaponry and golden funerary masks. In the Sculptural Collection, the visitor will follow the development of sculpture in Greece, with stunning examples of Archaic Kouroi and Korai, sculptures of the Severe Style, as well as the well-known bronze statue of Poseidon/Zeus (the subject has been a matter of debate), found in Cape Artemision in southern Euboea. On the second floor the central room exhibits finds from Thera dated around 1600 BC. The circular route around the central room walks the visitor through the development of decoration and construction techniques of Greek pottery. There are also rooms with terracotta figurines, the Cypriot Collection and jewelry. Interested in experiencing something new? Book now our "Make your own Souvenir workshop" and create your own piece of art! This might seem a bit overwhelming for you, especially if you are visiting the museum for only a couple of hours. Like any other big museum, you need at least a few hours, or even two days, to fully absorb and understand everything you will be seeing. 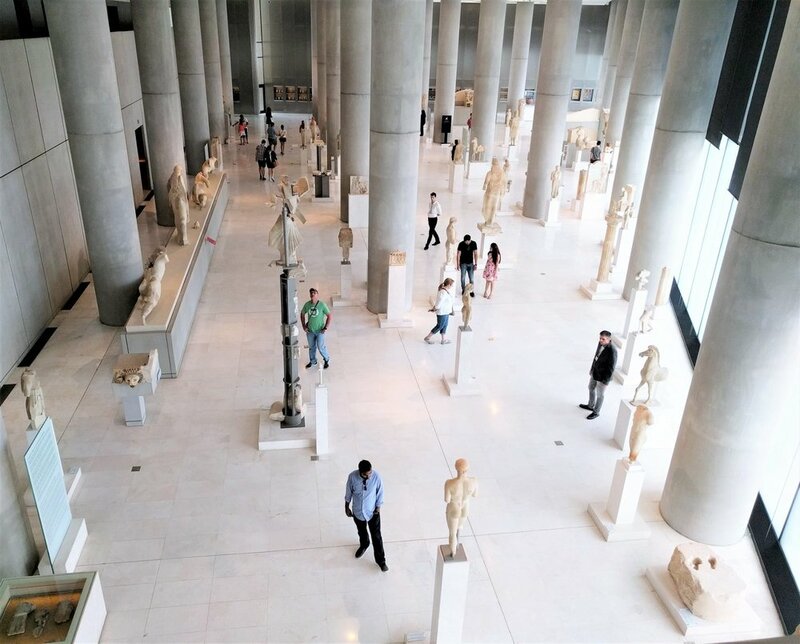 The Acropolis Museum is a real gem in Athens, not only for its exhibits, spanning from the Mycenaean period to Early Christian era, but also for the award-winning museum building itself and the stunning view to the Acropolis. If you have time, I would advise you not to rush through this museum, as there is much more to see than the Parthenon marbles. Start your visit with the Gallery of the finds from the slopes of the Acropolis hill. This includes archaeological finds from sanctuaries on the slopes of the Acropolis, as well as everyday life artifacts from the settlements. These cover all periods of antiquity. The glass floors let you sneak a peek at the archaeological excavations as you walk around the museum, which is really cool! Continue to the Archaic Gallery, with sculptures of young women (korai) and riders among others. On the third floor, you will find the Parthenon Gallery, with sculptural decoration from the frieze, the metopes and the pediments. The frieze, depicting the Panathenaic Procession, is in the middle of the room and unfolds over the 160 metres of sculptural decoration. Most of the original frieze however is at the British Museum. Finish your tour of the museum with the north wing of the first floor, with exhibits covering a large period, from the 5th century BC to the 5th century AD. Keep in track of the Acropolis Museum events and activities, with the A Day at the Acropolis Museum program. I strongly also advise you to enjoy a coffee, a snack or food at the Restaurant of the Museum. Not only will you enjoy delicious dishes and desserts but also have a breath-taking view to the Acropolis Hill. The Benaki Museum, in the heart of Athens city centre and in my opinion an excellent museum for someone who wants to follow the history and art of Greece throughout the years, from antiquity to today. The main building is located in the corner of Vasilissis Sofias and Koumpari Street just a few blocks from Syntagma square towards Evaggelismos. The permanent collections start from Prehistoric, Ancient Greek and Roman Art, continue to the Byzantine Art up to modern Greek period from 18th century AD and onwards, with the amazing Historical Heirlooms collection. Frequently, the Benaki museum has some amazing exhibitions of contemporary art, so it is well advised to check their official website frequently. The current exhibition Photographs of Joan Leigh Fermor: Artist and Lover, hosts pictures that Joan Leigh Fermor took while she traveled with Paddy around Greece, between 1940s and 1960s. The museum has a lovely roof terrace café with a view overlooking the National Gardens. You definitely have to take a break here during your museum visit. On Thursdays, the museum has free entrance and does not close until midnight, making it possible for an evening visit as well (also a nice date idea!). The Benaki museum has also two other branches, which are both also worth a visit, the 138 Pireos St. building, with more modern collections and exhibitions, and the Museum of Islamic Art in 22 Ag. Asomaton & 12 Dipilou St, with the private collection of Antonis Benakis which he started while living in Egypt. They have both different opening hours and ticket prices which can be found on their websites, links being added above. The National Museum of Contemporary Art (EMST) in Athens was first established in 2000, however the reconstruction and opening of the old Fix Brewery as the main museum building took place only in February 2014. Nonetheless, it is one of the most interesting and well-organised museums in Athens, aiming to exhibit and promote contemporary Greek and international artists. The Fix Brewery building, originally constructed in 1961 as a beer brewery (my Greek beer of preference by the way), is still undergoing restoration, in order to house additional art facilities, educational programs and activities, workshops, as well as the permanent and temporary exhibitions. At the moment, the museum does not have a permanent collection, rather the museum organizes temporary ones with the aim to include parts of them in the future permanent collection of the EMST, with a focus on many different types of contemporary art such as painting, photography, video art, installations and new media. I visited the museum with a friend of mine, Fivos, a few days ago on a very hot summer day, so here is what is on at the moment! You start your museum tour from the ground floor, with George Drivas’ Laboratory of Dilemmas, which we both found extremely interesting. The installation walks you through a labyrinth with video and audio sources, unraveling the story of an unfinished medical experiment. The main concepts that arise are socio-political and moral battles, inspired by the ancient Greek tragedy of Aeschylus, Iketides. I found the installation very intense and I was feeling a bit agitated over the dilemma of the scientists. The fact that the experiment was never completed adds to its dramatic effect. When you exit Drivas’ installation, you walk past Hyper Realities by visual artist and photographer Benjamin Von Wong, introduced by a collaboration between TEDxAthens and EMST. Through a series of photographs and videos the artist comments on current socioenvironmental issues and how the misuse of electronic waste, the fashion industry and the disposal of plastic is affecting our environment. On the first floor are exhibited the winners of the Good Design Greece Exhibition 2018. The committee of the awards had to choose between more than 200 entries by Greek and Cypriot designers! A lot of interesting exhibits are on display here, including the Nice Biscuits (AG Design Agency), biscuits in the shape of famous archaeological finds, which of course drew my attention. On the lower floor there is space for exhibition of work of contemporary Greek and international artists as well some more winners of the Good Design Greece Exhibition 2018. Discover Athens Ancient Wonders on a wooden bike under the guidance of a local expert! Overall, a very nice museum, especially if you are into contemporary art and design or if you want an alternative way to escape the Athenian midday heat. Which are your favorite museums in Athens? Let us know by commenting below!